Who doesn't love a great throwback craft? When you were a kid, you may remember sitting in a movie theater wearing a pair of red-and-blue glasses and watching in awe as the movie screen became 3-dimensional before your eyes! The red/blue images you saw are called "anaglyph 3D images" and they contain two different filtered images. When you wear your color coded (red and cyan) glasses, the visual cortex of your brain fuses the image together, creating the perception that you're looking at a 3D image. Now you can bring the magic to your own home with your kids. 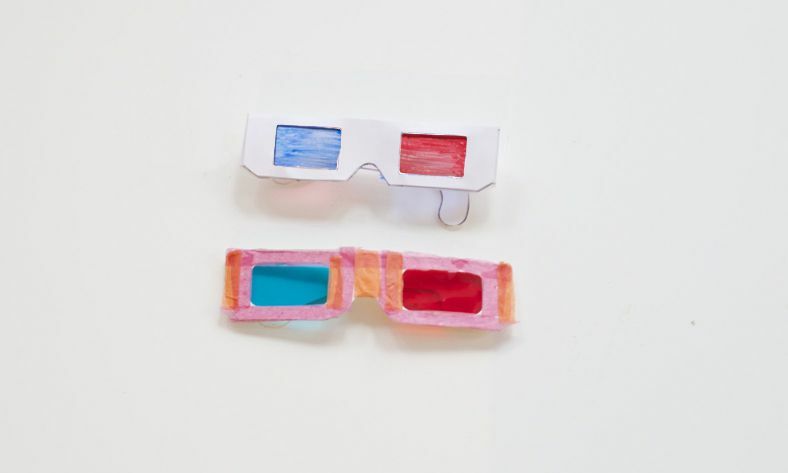 Making your own 3D glasses is easy and only requires a few basic steps. When you are finished making them, try searching online for some 3D pictures to test your glasses out on! Print out the 3D glasses template. You can download this JPEG and print it at home on card-stock. Note: If you use regular printer paper instead of card-stock, your 3D glasses will not be sturdy enough to wear and enjoy. Cut out the 3D glasses template. If your child is making this craft and is under the age of seven, you may need to carefully supervise this step if they are not proficient at cutting paper. Using the lenses from the template as a guide, draw a rectangle on your ziplock bag with the red permanent marker. Color it in and then repeat ​with your blue permanent marker. Use scissors to cut out the lenses you just colored in on the ziplock bag. If you are using colored mylar or acetate sheets, use the lenses as a guide to cut out rectangles for your glasses—you should have one blue (cyan) and one red one. Use glue dots or tape to stick your lenses onto the back of your glasses. The red lens should be covering the left eye hole and the blue should be covering the right eye hole. Tape on the glasses' arms that you cut out previously from the printed template. One arm goes on the left side, the other goes on the right side. Fold the top part of the template over the lenses and use tape to seal it together. 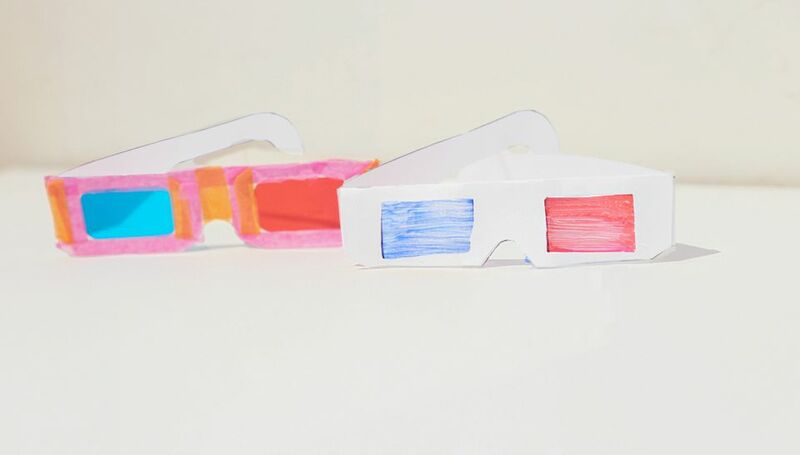 After this step, you can decorate the front of the 3D glasses with craft supplies if you want (but be careful not to obscure the lenses!) Get creative with your decorations by using glitter, ribbon, felt, tissue paper, or craft paper. Now go look online for 3D pictures to test out your glasses!